Point Pleasant’s Lanea Cochran (11) attempts to push the ball past a block attempt by Wahama’s Emma Gibbs (7) during the Lady Knights victory over the Lady Falcons on Thursday night in Mason County. 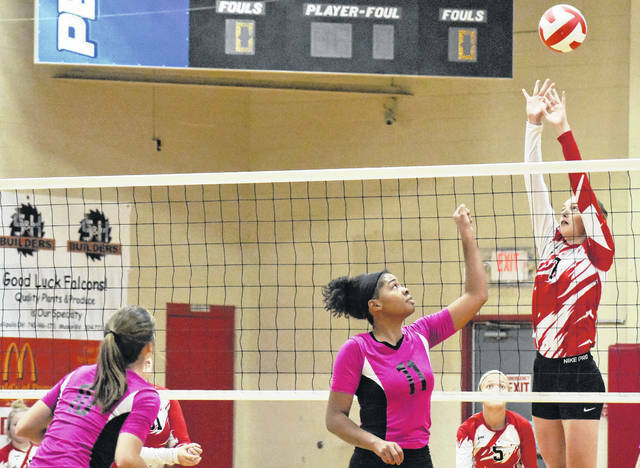 POINT PLEASANT, W.Va. — For now, the bragging rights belong to the Lady Knights. The Point Pleasant volleyball earned a season sweep of host Wahama on Thursday night, by way of a 25-12, 25-17, 25-16 three games to none victory over the Lady Falcons in a non-conference match in Mason County. Following a 3-all tie in the first game, the Lady Knights (28-3) never again trailing in the contest, as they outscored WHS (2-17) 22-9 the rest of the way, en route to a 25-12 victory. The second game was tightly contested the two teams remained in a see-saw battle for the lead before knotting the score at 8-all. From there, the Lady Falcons utilized a 4-0 run to take a 12-8 advantage. The Red and Black, however, rallied outscoring the hosts 17-5 to close out a 25-17 triumph. Wahama soared to a 6-1 lead early in the third game, before the visitors manufactured a 9-4 scoring run to tie the game at 10-all. From there, Point Pleasant never again trailed, as they outscored the Lady Falcons 15-6 to close out a 25-16 win and 3-0 match victory. The Red and Black service attack was led by Peyton Jordan with 14 points, followed by Katelyn Smith with 12 points, including one ace. Lanea Cochran was next with 10 service points, including four aces, while Olivia Dotson was next with nine points, including a pair of aces. Haley Milhoan posted four service points, including one ace, as Madison Hatfield concluded the Point Pleasant service attack with three points, including two aces. The Falcons service attack was led by Harley Roush with six points, including one ace, as Logan Eades, Emma Gibbs and Hannah Billups each followed with four points apiece, respectively. Gracie VanMeter was next with three service points, as Alexis Mick closed out the Wahama service attack with one point. As a team the Lady Knights finished with 75 digs and six blocks. In contrast, the Lady Falcons had 65 digs and three blocks in the contest. For the Lady Falcons, head coach Matt VanMeter noted that his team’s ability to start well, but were unable to overcome mistakes. Point Pleasant returns to action Monday when it hosts the winner of a Class AA Region 4, Section 1 match between third-seeded Nitro and sixth-seed Sissonville in Mason County. The White Falcons also begin postseason play on Monday as they travel to face Wirt County in a Class A Region 4, Section 1 game at 6 p.m.